The Police Officers Federation of Minneapolis is officially invited to participate in the upcoming Minnesota Guns ‘n Hoses Poker Challenge. The Guns ‘n Hoses Poker Challenge is a national competition with 50 events around the country that features groups of players from Law Enforcement and Firefighters from the region battling it out on the felt for bragging rights, the Guns ‘n Hose Team Trophy and the right to represent the State of Minnesota at the Guns ‘n Hoses National Championships. Each local event features dealers and tournament staff from the World Series of Poker, world class poker tables, custom chips and much more. Players will compete for the opportunity to represent Minnesota at the season ending Guns ‘n Hoses National Championships and play for a share of $100,000 in cash and prizes including a custom Guns ‘n Hoses Harley-Davidson and the Championship Bracelet. It’s a spirited, friendly competition that raises funds for the National Law Enforcement Officers Memorial Fund and the National Fallen Firefighters Foundation. Two highly respected organizations that serve the Law Enforcement and Firefighting communities and those making the ultimate sacrifice. The event is open to Active Duty and Retired LEO’s and Firefighters as well as civilian employees of Law Enforcement and Fire Departments. Teams can represent their Department, Association or Union. Friends & Family as well as supporters of law enforcement & firefighters are also encouraged to participate. The tournament features a unique team and individual competition pitting teams of ten from law enforcement/firefighter departments as well as motorcycle clubs and dealer groups from around the region. To participate, we need someone from your organization to act as the team captain and organize the nine other players to represent your organization. Multiple teams from your organization are permitted if you have players wanting to participate. GUNS ‘N HOSES IS OFFERING A SPECIAL BONUS FOR THE FIRST 5 TEAM CAPTAINS TO SIGN UP. EACH WILL RECEIVE A COMPLIMENTARY “RE-BUY” TOKEN AT CHECK IN. SO REGISTER TO DAY TO RECEIVE YOUR SPECIAL BONUS. Your team can earn a competitive edge in the form of Bonus Chips if they sign up quickly as well as a special bonus for the team captain for helping get the team together. The event is limited to 20 teams so register today. If you are interested in coordinating a team, send an email to Registration@GunsNHosesPoker.com and we will reserve a table for your team. 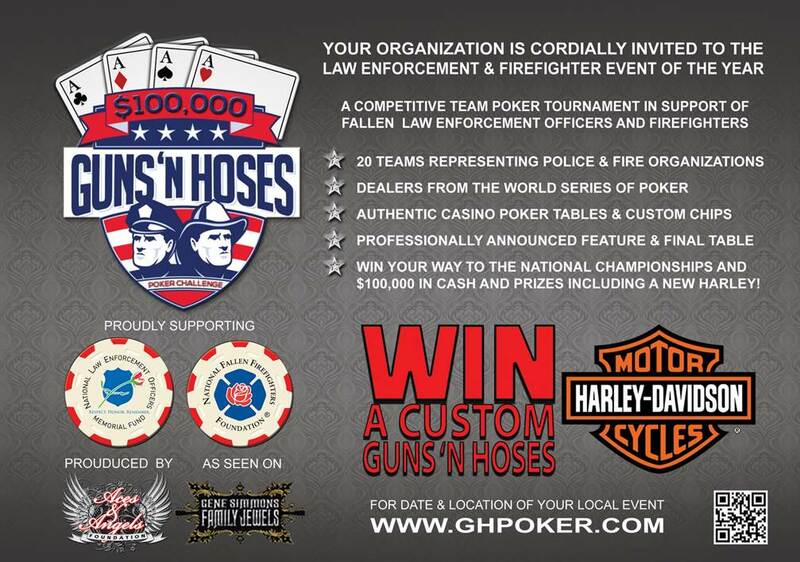 For more information, log onto www.GunsNHosesPoker.com. Your Official Invitation is below. You can click on the invitation to visit the Guns ‘n Hoses website.